The plant originates from Central Europe and is very widespread in North America and Africa, and also in the Middle East. Arugula salad is a very good and medicinal vegetable, which contains a lot of vitamin C and a lot of valuable minerals. It is particularly rich in iron, but there are other beneficial ingredients, some of which stand out and they are the vegetable fibres that help better digestion and allow us to regularly empty the colon. Below read more about its cultivation, as well as interesting recipes for dishes with arugula. Arugula is an annual or biennial herbaceous plant, which is planted for its leaves, which have a very specific aromatic taste. Its leaves are known to be very rich in vitamins and other valuable elements, it has a great stimulating effect on the entire human body, especially on our intestines and stomach - which allows better performance. The leaves are on short stalks, length up to 20 cm and high about 6 cm. At higher temperatures, the plant develops floral stalks with clusters of flowers that are light yellow or white in colours. Vegetable growers are well aware that the rocket salad is resistant to frost, and therefore it is very grateful for the cultivation, as it can be produced throughout the year. It thrives on almost all soils. Requires partial shading and soil that retains moisture better. Growing arugula is done in early spring, in March, when you can sow it successively every week until October. In this way you can pluck its leaves over winter period. It is sown in the line with 25 cm space between the lines and about 5 cm between the plants in its own line. The seeds of arugula are very small. Salad of arugula is harvested, only when leave are fully developed. If you have no space where to cultivate your plant, do not worry too much, because arugula freely grows in the pot. 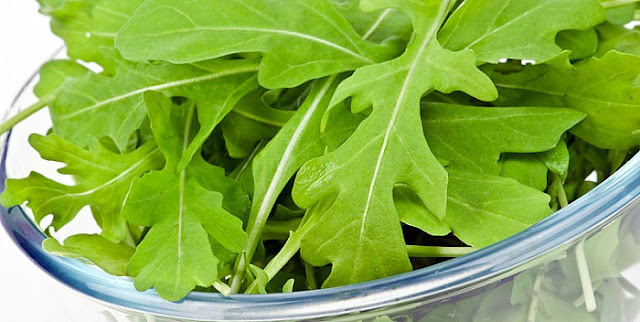 These vegetables contain high levels of folic acid and antioxidants, such as vitamins C, A and K, the plant arugula is known as a very successful fighter against free radicals. All these vitamins have positive impacts on improving the condition of our teeth, eyes, lungs, and bone health. Arugula salad is packed with fibre, which helps digestion and boosts metabolism. It causes a feeling of fullness and reduces the desire for sweet and fatty foods that our body requires. It lowers cholesterol and regulates blood-sugar is in the blood. It abounds in carotenoids, many minerals, such as calcium, manganese, potassium and iron, which are more than useful in human nutrition. Arugula plant is advantageous in comparison to other vegetables, it contains low levels of oxalate, which assist in preventing the absorption of minerals in the body. Experts point out that this plant keeps the cardiovascular system, reduces the risk of many diseases of the heart, and it contains substances with anti-cancer properties. They find it is a natural antibiotic because arugula salad regulates digestion, is useful in the treatment of osteoporosis, duodenal and stomach, constipation and chronic constipation, coughs and colds. It is one of the best defences for your body, it improves strength, endurance and immune function, and therefore is recommended for athletes (professionals and amateurs). Antioxidants and phytochemicals which are contained in the arugula leaves, are useful for the health of all those that incorporate vegetables in the daily diet. Arugula salad contains a high percentage of vitamin B-group that raises energy and fuel growth of red blood cells. Thanks to its high content of carotenoids, rocket is a real powerful ally in slowing macular degeneration, which causes cataracts. Also arugula salad when plugged into a diet can help you lose excess weight in a healthy way, but at the same time to keep your immune system under control without changing your diet drastically. When you consume this healthy plant, we reduce chronic inflammatory conditions in the body. Salad with arugula is healthy because it contains bioactive components that have been shown to inhibit various inflammations. This healthy vegetables can help you defend yourself from aging brain, because it is proven that in older people folate deficiency causes cognitive disturbances. If desired, you can add avocado. Arugula salad is prepared as follows: all the ingredients need to be washed, then mixed, and season to taste. Enjoy its healing properties and exceptional taste. Arugula salad, which we have already written about is not the only recipe that we will now share with you. These vegetables can improve the taste of many dishes. Added to the risotto, soups, sauces (especially those with tomato) and others. This extraordinary Mediterranean plant is simply loved and appreciated it in the kitchen. We will bring you another great recipe which uses the leaves of arugula. What is necessary for the dressing? Preheat the oven to 180 C, and put a baking paper in the baking pan. Cook 100g of arugula for about 10 minutes in a boiling water, then leave it to cool. Pour the chilled arugula in a blender, add the almonds, parmesan, garlic and onion, basil, parsley and cayenne pepper. Add salt and pepper to taste. Then whip the eggs and pour into the mass of the arugula. Shape it into meatballs, and roll in bread crumbs, then, arrange in a baking pan and bake for about 20 minutes at 180 degrees. The rest of fresh herbs, put in a bowl and pour the mixture of apple cider vinegar, olive oil, lemon juice and gently mix it. Ready-made meatballs, arrange on the fresh arugula and, if desired, garnish with slices of tomato. Can we use arugula during pregnancy? Arugula salad is a very valuable food, which in just 100 grams contains about 10 calories and is rich in vitamins, which are more than desirable for pregnant women to take. If at the first bite you do not enjoy its distinctive taste, try to save it as a salad with potatoes and boiled eggs. It has a certain bitterness, which can be easily removed if you briefly fry it in olive oil. You will love it for sure, but when you get used to its aroma, go to the original recipe. Phenomenal arugula salad is a good choice for dieting, because in addition to the low calories it provides all the necessary nutrients that our body needs during the restrictions - so be sure to include it in the menu.